The temperatures have taken a plumet and its a lot a colder here compared to the mild autumn we’d been having. I dont mind the cold as long as its dry )my god, i sound like an old lady!) But today was not.. wet soaking rain..no fun! So we stayed in and had a DVD day. I introduced Neo to The Lion King and sang all the songs, each and every word. It used to be one of my favourites. I have seen the show live in New York and a small production of it in Disney too. I hope to take Neo one day. Would be lovely to have that mother son moment with him. I was inspired to mix these colours from seeing Sandy Al A Mode‘s post. Blogging is such a great inspiration, you ladies are all wonderful and totally keep me in fresh ideas to mix up my wardrobe. Wine (that sounds far better than oxblood, yuck! 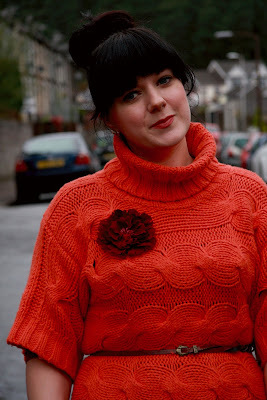 ), orange, purple and raspberry. 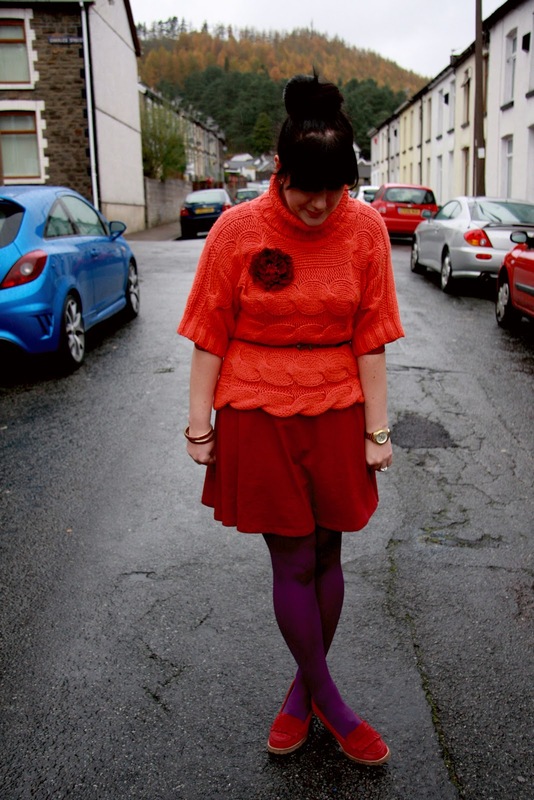 It may not be for everyone but i just loved the cheery colourfulness of this outfit. Plus i was snuggly warm in my big thick sweater which is about 4 years old. My collection of knitwear has grown over the years and now i have so many i literally have no where to put them. A pile of knitwear is currently on my bedroom floor waiting to be homed. I’m thinking under-bed storage…stat! I also very nearly got rid of these shoes a couple of weeks ago. Kinda glad i didn’t now! And the skirt here is actually a dress of which i have many a plan for! It’s a little light weight (helloo Marilyn Monroe moments a leetle too often! ), super stretchy, super comfy and also a bargain at £13.00. Stay tuned this week ladies i have some big news, an amazing GIVE -AWAY(this Wednesday) and something new and super fun towards the weekend! So excited!!! Next Post Max C London Giveaway!! You look brilliant in that clash of colours, Rachel. It is fabulous to inspired and be inspired by bloggers. Tell us the big news!! 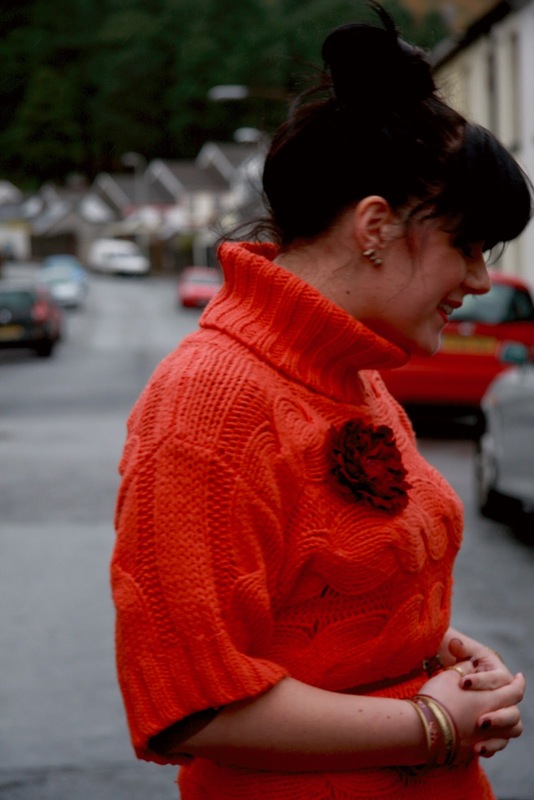 : > You look great in this outfit — love the cozy sweater and I am so happy you kept the shoes – perfect! 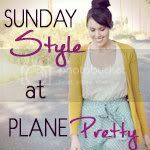 Thanks for linking up to Visible Monday. What bold experimental color. You are inspiring! Beautiful color and great outfit like the shoes! I love the tights and also your sweater–super cute. Looks lovely! Spookily we are having a DVD day today as Elijah has been up with a sickness bug in the night, first DVD of choice……the lion king! Ahhhh half term joys! Great color combination,you look fabulous! Love that jumper, so bright and snuggly! I love the color combination here, stunning! 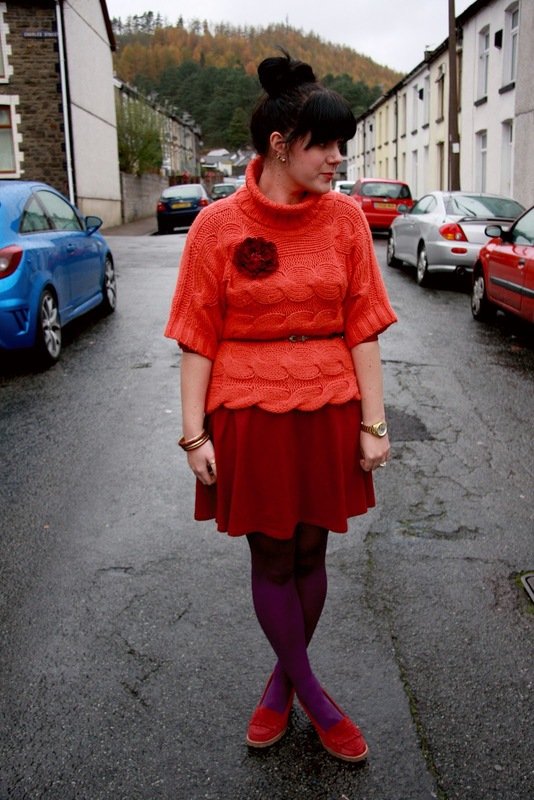 The red shoes and purple tights are brilliant! Rachel- this is my favorite! What an absolutely amazing color combo, I am already scheming ways I can try it out! As someone who tends to lean towards blues and greens and earthy colors, this is something I would really like to try! Stay warm and dry girl, happy monday! This is a cute monochromatic look! Oooh, what a nice combination of colours! Beautiful! Looking lovely. What great color aginst the grey skys. I often think bright hues are wasted on the summer months. I'ts now that we need them! I missed your cozy sweater combinations. And this rich color scheme is genius. LOVE these shoes, I'm glad you didn't get rid of them!